Let me explain the purpose of this program and why I couldn’t just use existing soft. 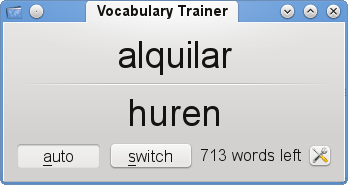 Kvtml format: use the vocabularies you created in Parley/KWordquiz. Only the enabled (with a checkbox) ones are trained. Automatic mode: cycles through your word list using configurable time delays, no interaction needed. Put it in a corner of your screen. Popup option: useful when you want to be welcomed by a new word every hour/day, for example. Good to keep you in the game during holidays. Manual mode: go through your word list at your own pace using mouse/keyboard, optionally skipping solutions. Auto font size: useful when you put it full screen so you can still read it from a large distance while cooking/eating/doing the dishes.. Lean and mean: you should be able to run it off your smartphone (didn’t try this scenario, since I don’t own a smartphone yet 😉 ) Uses QXmlStreamReader for fast yet memory conservative parsing. Currently, configuration is done through the config file (located in $HOME/.config/Mattiesworld) but a gui dialog is coming. I also plan on supporting 2 configurable profiles: normal and fullscreen. VocTrainer is open source and still fully in development over at gitorious. During the Steam Holidays (xmas 2009) I picked up Mirror’s Edge for a few bucks. I definitely do not regret. Mirror’s Edge stands out by its intriguing graphical style and gameplay. I totally dig the visual style based off primary colors like blue/red/white. See it for yourself. In general, the atmosphere of the game is really great. The active modern city presented in an clean abstract art way really ends up right. Visual effects are being used where adequate: blooming sun when you climb from a ladder in the shadow on the top of building. HDR effects: when you kick in a door and enter a building your eyes have to adjust to the darker environment. Vice versa when you escape out of a building. Narrowed vision when running at top speed. Motion blur when something happens in slow-motion.. Nothing special, but it makes the experience complete. On a funny side-note, this is also the first FPS game I encounter which has REAL working clocks! I was in an office with a clock on the wall and noted the time. Later, when I came by again, time had passed, in real-time! 🙂 Clocks are often just textures, not in ME! Basically it is a lot more fun to take out a guy matrix style by wall running and then perform some special kick jump/strangling move than to shoot them from a distance. Talking about distance, there is one time you can really use that sniper gun you just got hold of to clean the area before infiltrating a facility. But they don’t overdo a certain game mechanic so it doesn’t get repetitive. I was also disappointed to learn that the achievements websites are talking about are actually XBOX achievements and have not been ported to Steam! Would’ve been extra fun.. The game is not too long (less than 10h) but I don’t mind short games since otherwise I don’t get to finish them. 😉 It does have some replay value as you can time trial the existing levels. It is actually fun to do the time trials of the levels because now you know all the moves/possibilities without having to think too much. You can actually play the game like in the demos/trailers then. 😉 The time trials are in fact exactly the same as the story mode (enemies inclusive), but you get a timer in the top right of the screen. There is also a global online ladder but I didn’t try that as you have to log in with your EA account for that (which of course, I don’t have handy when I’m in a game). For the die-hard fans, there is also some DLC released in January 2010, which is cool, if you live in a console world. 😉 As a pc gamer, I’d rather try out some fan-made extra content which is popping up on moddb. It’s going slowly though, as DICE does not officially support custom maps. But as usual, some smart peep figured it out. Another interesting moddb project is “Mirror’s Edge: Source“. Basically some guy saw the Mirror’s Edge trailer and decided to try out a remake (a premake actually, since it was before release of the game 😉 ) using Valve’s Source engine. To quote the author: “I did all of the modelling and mapping by sight while pausing the trailer in parts that I was working on.” It turned out quite well, too bad he never finished his work. 😉 Of course, mimicking the graphical style would certainly not be sufficient to recreate the feel of a game like ME. If you are looking for wall papers or the latest ME news, I can highly recommend http://mirrorsedgefans.fr. It contains every single news fact there is to know about ME and has every ME wallpaper/fan art/concept art known to mankind in its gallery. All-in-all, I can highly recommend this game! I will remember it for it sure. Update 3 apr 2012: read my thoughts after a replay on hard. Since I don’t own a gigabit router but I do have Gbit NICs on my laptop and main computer, I set up a peer to peer network for optimal performance when I have to transfer a large volume. I don’t do that often so I end up losing time every time. So I decided to write a small blog post about it. 🙂 My concrete setup is transfering between a windows and linux machine. However, on my opensuse 11.1 box, it seems not automatically configured for that. 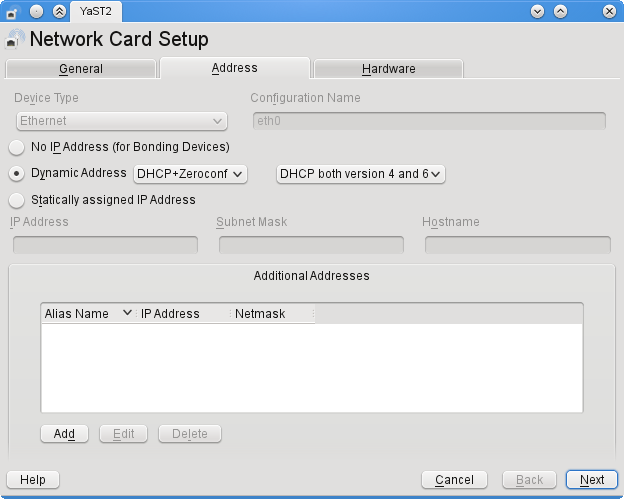 When you open Yast -> Network Settings, edit the network interface and enable “zeroconf” under “dynamic address”. All easy peasy and intuitive.